Providing tools for your patients to connect with you on whatever platforms they prefer is key to successful engagement. Many patients prefer to connect digitally to schedule appointments rather than traditional phone calls, so it’s important to offer an online option. Similarly, it’s critical for your communication platforms to offer multiple ways for your patients to connect with you. Building a private messaging platform for healthcare isn’t an easy process. As a product team we had to consider security requirements including HIPAA and 42 CFR while not overlooking usability and design. Far too often we see patient messaging apps which were clearly built without the patient experience in mind. The CaredFor, client-branded, messaging feature was modeled after existing messaging apps. 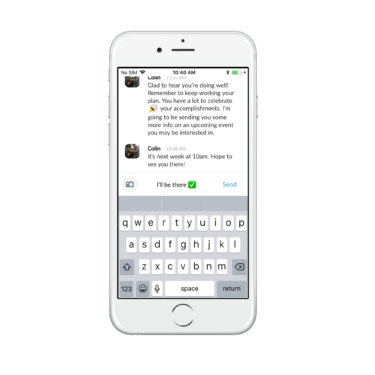 We wanted our users to have instantly familiarity with the product, make it easy to create a message, and control notifications. By focusing on design and usability we’re able to drive higher adoption and ultimately improve our client’s communication with their patients. From the web interface, administrators can easily search for the desired patient and create a message. In some cases we realize that a therapist or counsellor may need to include another staff member on a thread with a patient, so we included ways to add multiple recipients. These seemingly simple features, together, create a robust system for supporting your patients. Additional features like images and links allow the patient and provider to easily exchange detailed information. Optional integrations with an EMR provide for a single system to manage and store all communication and allows for additional updates, like appointment reminders. By adding patient messaging into the CaredFor app we’ve not only added a critical feature, but further streamlined the systems needed to support patients and alumni. Our platform is quickly evolving into a comprehensive solution for providers addressing substance use disorders (SUD). Learn why dozens of providers and thousands of users trust CaredFor.